ADDRESS: 2414 Glenshire Lane, Tallahassee, FL 32308. Thomasville Road to Killarney Way left on Forsythe Way, right on Glenshire Lane. SQUARE FEET: 1738 sq. 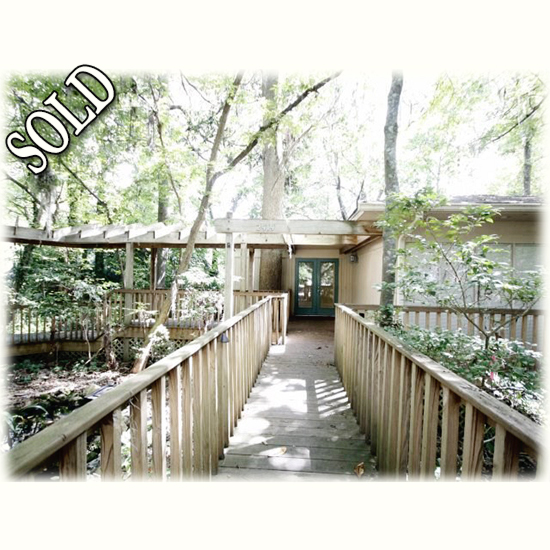 ft.
OTHER: Cool Contemporary tucked into wooded lot with privacy plus! Low maintenance yard. Soothing water feature with mini water fall leading to front entrance. Extensive decking around house with walkways. Many floor to ceiling windows and extra doors to decking. Combo living-dining rooms with two way fireplace; both have tray ceilings. Kitchen with cook island; super pantry storage. New refrigerator. Believed to be recent: HVAC, dishwasher, water heater and flat roof (checking). Detached over-sized garage. End of cul-de-sac. Road in process of being turned over to the City. AS IS with right to inspect. Conventional and Cash offers only. No SPD; was a rental. Come out to see!